Chances are that at least some of the time you bring your own bagged lunch to work or to school. Sure, there are days when you go out for a nice meal with co-workers or pay for the school lunch on pizza day, but when I think back to my school days I fondly remember those brown paper bags. And when I think back to when I worked in the corporate world, I remember how much money I spent going out until I switched to bringing my own lunch from home! Unfortunately, all those bags and disposable products leave behind a ton of waste over the course of a year, too. Think about what goes in to a bagged lunch: paper bags, plastic bags, aluminum foil, styrofoam, napkins, waxed paper, disposable forks, knives, and spoons, juice boxes, soda cans, etc. The list goes on and on. All that stuff has to go somewhere and most of the time it is just thrown “away” – even though there really is no such place. According to the organization Waste Free Lunches, the average school-age child eating lunches in disposable packaging generates some 67 pounds of waste per school year. Multiply that by million of kids (and adults going to work) and you can see how much of a problem this is. Thankfully there is a better way to “bag” your lunch that is both good for the environment AND saves you money. That’s it! It’s quite simple, really. Everything in that lunch bag can be washed and reused or at least an be dealt with in an environmentally-friendly manner. For example, most leftover food scraps can even be composted (other than meat, of course) so they can be brought home if a school or workplace doesn’t do composting. It may seem cheaper to buy plastic bags, paper sacks, and disposable utensils when you need them but over the long run it’s much cheaper to buy reusable goods that will last years and years. Of course, that’s only the financial savings. Think of all the plastic and paper that won’t need to be made and shipped only to then end up in our landfills, recycling centers, or in nature where it can negatively affect wildlife and even our drinking water. It’s crazy how much trash we generate even when there are easy solutions! The best way to reduce the amount of waste we throw away is to not create it in the first place. A few simple changes at home can go a long way to cutting your environmental footprint on the planet. From the time they start school at around 5 years old until they graduate from high school, the average student can generate 871 pounds of needless trash that we have to deal with. That’s a lot of trash that can be saved just by switching to packing a waste-free lunch five days a week. Make 2013 the year you move from disposable lunches and materials to reusable ones. The planet (and your wallet) will thank you! So, what does your lunch look like? Our kids are not in school yet, so this is not a real issue for us. Before we started our company I would take lunch nearly every day to work. We would reuse as much as possible. Even with something like plastic bags you can wash them out & reuse them. We would get weeks worth of use out of one bag. Yes to washing plastic bags! My mom used to do that too and I continue the tradition whenever I have to use one. This is such an easy cost/environment saving step too many people skip. I was recently gifted a great thermos coffee mug that gas displaced my daily coffee purchase. It saves a little money and cardboard! Besides, there’s nothing better than drinking the kind of coffee you love rather than whatever the store has! This is an excellent post! I bring my lunch to work every day. I use a reusable bag to carry it all in. I have a reusable coffee mug for my coffee, and a reusable water bottle for my water. Unfortunately, I haven’t gotten onto using reusable Tupperware for my sandwiches yet, I still buy plastic baggies, but this post has reminded me I’m only one step away from significantly reducing my impact on the environment. Thanks! Cheaper, more environmentally friendly and so much more easier! I eat at home now. Before I brought a tupperware to work and drank water out of glasses provided there. There was also cutlery and a microwave. Strangely I was the only one in the office doing that, everyone went to the supermarket for sandwiches and a bag of chips and they made fun of me for bringing lunch. The waste is a topic I am sensible to and throwing away plastic (and half your lunch) is something I couldn’t do. I also bring my lunch in reuseable containers. I like the fact that not only am I being green but I am also eating healthy. The stuff we buy on the run isn’t good for us. Cloth napkins are great. I use them at home all the time. They are so nice on the face and so easy to wash. Trust me you will get used to them and fall in love with them. Good tips! Today, I have leftover spaghetti squash in a thermos and I am using one of my old forks to eat it. 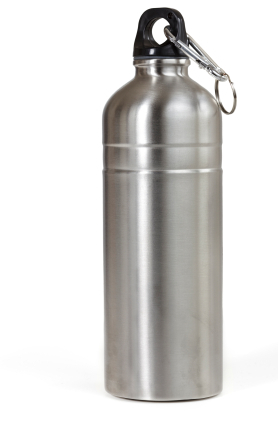 I also carry a liter of (tap) water in an aluminum container. No waste! Good stuff. I do the same thing. I must refill my aluminum bottle 4 times a day at work. I am lucky in that all of my co-workers bring lunch. Now getting them to wash their dishes in the staff room is a whole other issue! I would note it isn’t that difficult to pack kids’ school and childcare lunches in reusables and to bring them home each day. They always have to round up their backpacks, coats, school notices, etc anyway. My coworkers are the same. There are always dirty dishes in the sink. Baby steps I guess. At least they are bringing lunch right. Great tips! I always bring my lunch in glass containers that are used over & over. One thing I should work on is the disposable silverware though. Yes those are evil. Just take an extra set of metal ones from your house to work and then store them there. You can wash them and use them every day with your lunch. It’s not just packaging on food but all packaging that is incredibly wasteful, not to mention so difficult to get into you end up destroying the product as well as the packaging! I agree. I hate that hard plastic stuff that you always seem to cut your hands on. It should be banned. Great tips. Cannot believe I used to drink from plastic water bottles 5 years ago. I have been really happy with the Klean-Kanteen ever since. Have to say that cloth napkins is probably the one tip I will not follow. Much easier with a paper napkin and I believe it is also the one having the least impact of all the tips. Glad you have given up plastic water bottles. They are so bad for the planet and generate a ton of emissions to ship. Cloth napkins are great. You really should give them a try.